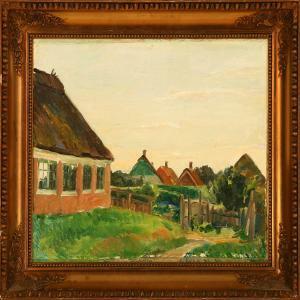 Find artworks, auction results, sale prices and pictures of Johan Rohde at auctions worldwide. 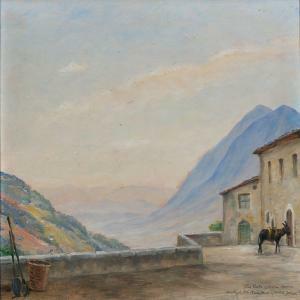 Italian landscape with mountains and a donkey in the foreground. Signed with dedication "Til Ruth og Vivian Hansen. Venligst fra Tante Asa og Onkel Johan R." (To Ruth and Vivian Hansen. Kind regards, Aunt Asa and Uncle Johan R.) Oil on panel. 37 x 40 cm. 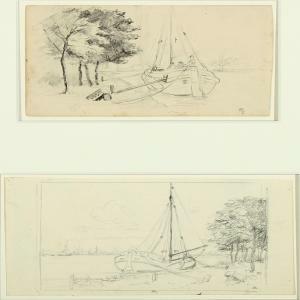 Studies for opus 94and 64. Two lead on paper, mountedon one sheet. Sheet size 12,5 x 20 og 13 x 23,5 cm. 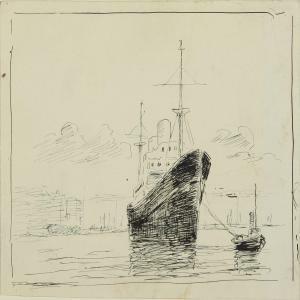 Johan Rohde: The steamer ismanoeuvred out of the habour. Unsigned. Ink on paper, mounted onsheet. Sheet size 17 x 23,5 cm. Unframed. The steamer is manoeuvred out of the habour. Unsigned. Ink onpaper, mounted on sheet. Sheet size 17 x 23,5 cm. Unframed. 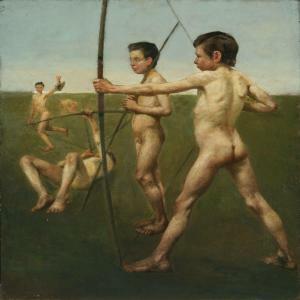 Johan Rohde: Young naked archers,recto and Interior with playing trio, verso. Unsigned. Oil onpanel. 48 x 43 cm. Unframed. Young naked archers, recto and Interior with playing trio,verso. Unsigned. Oil on panel. 48 x 43 cm. Unframed. Provenance: The author H. P. Rohde. Johan Rohde: "Gamle huse paa Fanø".Old houses on Fanø Island, Denmark. Signed and dated Johan Rohde1914. Oil on canvas mounted on canvas. 30 x 37 cm. "Gamle huse paa Fanø". Old houses on Fanø Island, Denmark.Signed and dated Johan Rohde 1914. Oil on canvas mounted on canvas.30 x 37 cm.